Built 1971 by Jeffboat, Inc., Jeffersonville, IN. MaK 6M453 diesels, repowered 1983, 7450 hp. Falk reduction gears 3.15:1. Kort nozzles. American Commercial Lines LLC, Jeffersonville, IN. renamed Amy W. Bramlitt 8/2014. 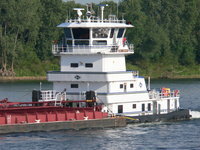 Rebuilt by James Marine, Paducah, KY 2015.